“I have to ask this question: where is this going? Petraeus is surely cooking the books, as the MoveOn.org folks aver in their great New York Times ad  nice to see they’re (finally!) growing a pair  but this avoids the larger question: what is the administration really up to in Iraq? They’re hanging on, “buying time,” as the pundits ceaselessly report  but what do they hope to accomplish? What actions? No answer is given: not that anyone is asking, at least not in the Congress or among the presidential candidates of either party. Prior accusations that IEDs found in Iraq were manufactured in Iran have proved sketchy, at best, and pure invention, at worst. Yet Petraeus’ words are simply taken as gospel, much as Colin Powell’s peroration of Scooter Libby-produced lies performed in front of the UN was hailed as a home run. Years from now, will we look back on the Petraeus-Crocker dog-and-pony show with the same bitter regret that nobody  or almost nobody  doubted them? You can bet the ranch on it. What, in the name of Allah, is “Department 2800”? There ain’t no such creature on God’s green earth. I can find no reference to it anywhere: not in the standard studies of Hezbollah, not on the Internets, not anywhere. The only other reference to this mysterious organization, aside from the testimony of Petraeus, is on the Web site of Veterans for Freedom, a pro-administration front group that exists as a prop for their leader, the square-jawed Pete Hegseth, to appear on television as a counterweight to VoteVets. In other words, they just make stuff up. Haven’t we learned this time and time again? It happened with Iraq’s infamous “weapons of mass destruction,” and now it’s happening again, this time with Iran’s alleged activities in Iraq. Refuting this farrago of half-baked fantasies doesn’t require any special knowledge, only a basic understanding of the current situation in Iraq and a bit of common sense. For example, why would Shi’ite militias go after the Shi’ite government in Baghdad  when, in reality, they are the armed wings of the parties that make up that government? Even more egregious is the contention that “it is increasingly apparent to both Coalition and Iraqi leaders” that “Iran seeks to turn the Iraqi Special Groups into a Hezbollah-like force” to “fight a proxy war against the Iraqi state.” Is that why Iraqi Prime Minister Nouri al-Maliki traveled to Iran recently, where he walked hand in hand with President Mahmoud Ahmadinejad, then took off for Damascus, where he was warmly greeted by the last of the Mesopotamian Ba’athists? A proxy war is being fought in Iraq, but it isn’t one pitting the Iranians against the Iraqis: the U.S. is the proxy, fighting on behalf of Israel against Iran and Syria. That’s what all this malarkey detailing how the Iranians want to “Hezbollah-ize” the Iranian-run “Special Groups” is about. So now we’re fighting Hezbollah, a group that arose because of the Israeli occupation of Lebanon, and is concerned exclusively with ridding their country of Israeli troops and influence. The “surge,” as the escalation of the war is being euphemized, is working, albeit not in the way the hapless Democrats and the American public understand it. “Progress” in Iraq, insofar as this administration is concerned, means we’re closer to war with Iran. That has always been our target, and now that we’ve got the Ba’athists out of the way, we don’t mind allying with the “dead-enders” against the real enemy: the Shi’ite mullahs of Tehran. In answer to questions from the senators, Petraeus gave away the show when he bluntly stated, “We cannot win Iraq solely in Iraq.” Oh no, we have to conquer most of the rest of the Middle East, including Iran, Syria, and who-knows-where-else before we can even begin to talk about winning in Iraq. 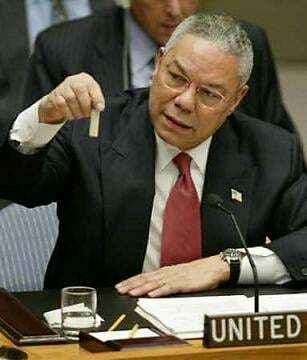 Every political leader who claims to be “antiwar” yet claims that we cannot just leave Iraq is complicit in this conspiracy to drag us into a conflict with Iran. Hillary, Obama, and all the Democrats except, perhaps, Bill Richardson, Dennis Kucinich, and Mike Gravel, and surely each and every one of the Republicans, with the single exception of Ron Paul  all are guilty, no matter how much they protest, of enabling this administration in its plans to carry the war into Iran, Syria, and even beyond: Pakistan, perhaps, or the oil-rich regions of Central Asia. We’ve said this over and over  down through the years!  until we’re blue in the face, and as the reality of it is becoming too apparent for even the worst evaders to continue dodging, I see that Andrew Sullivan has finally caught on. Well, bully for him  now that he, in his previous pro-war incarnation, helped bring us to this moment. The same realization is also dawning over at National Review, where Petraeus’ emphasis on blaming Iran for the mess we made in Iraq is being interpreted as good news (which it is, if you’re a warmongering, wholly-owned adjunct of the Israel Lobby). The dynamic sweep of the neoconservatives‘ grand plan to “transform” the Middle East and “drain the swamp,” as they put it, is something to behold. First, take on the Ba’athist Sunnis, pulverize them, isolate them, and let the Shi’ites fill the power vacuum left behind by Saddam. Then, change course abruptly, declare the Shi’ites  supported by Iran  to be the main enemy, ally with the Sunni remnants, and launch a final offensive against Tehran. Strike, stall for time, and strike again. Note, also, how the “redirection” in favor of the Sunnis allows the administration to claim substantial progress in Iraq: by allying with these former “dead-enders” and “terrorists,” we can say we’re bringing Iraqis “together”  even as the insurgents continue their battle with the ostensibly pro-American government. This is supposed to keep war critics at bay on the home front, but not everyone is falling for it. Yet isn’t that the mission of the U.S. military  to make us safer? To protect us from our enemies, here in the “homeland” (as they now call America)? It most certainly is not, at least not in the Bizarro World we fell into after the 9/11 attacks blasted a hole in the space-time continuum and rocketed us into an alternate universe  where up is down, right is wrong, and “security” means placing us all in imminent danger of yet another terrorist assault. Our camarilla of would-be conquistadors could care less about the security and safety of the American people: all that matters to them is their vision of “benevolent global hegemony”  and, of course, the security of Israel. That’s why the Lobby is moving full-bore into propaganda mode and we’re hearing the drumbeat of yet another council of war rising and drowning out the peoples’ plea for peace. Democracy? Forget it. The two wings of the War Party, known as the Democrats and the Republicans, have a monopoly on the political process here in the cradle of liberty, and, what’s more, they know it. No need to pay attention to the polls when both parties are committed to war. I‘ll mention, again, that I’m giving a talk at the 18th annual meeting of the John Randolph Club: “Speaking Truth To Power,” Sept. 21-22, 2007, at the Hotel Washington, 515 Fifteenth Street, NW, Washington, D.C. My topic: how the Washington wonk-ocracy keeps the foreign policy debate within certain “respectable” parameters. If you’re in the area, by all means drop by and say hello. For more information on the meeting, call 815-964-8111. Ask for Christopher Check. I’d also like to point you in the direction of Taki’s Top Drawer, a new online magazine founded by the fabulous Greek, Taki Theodoracopulos, where I’ve been blogging up a storm. It’s the one place where I can write what I like, and not necessarily about issues of war and peace (as important as those issues are, and as much as I enjoy writing about them, a guy needs a break every once in a while, and I’m grateful for the opportunity that the editors of Top Drawer have provided).